Get a personalized quote on selected items or email the list to a colleague or just to yourself for later viewing. Simpson Technologies GmbH is proud to announce our participation in this year’s German Foundry Days. On May 17th and 18th, the German Association of Foundrymen (VDG) is organizing the German Foundry Days 2017 together with the Federal Association of the German Foundry Industry (BDG). 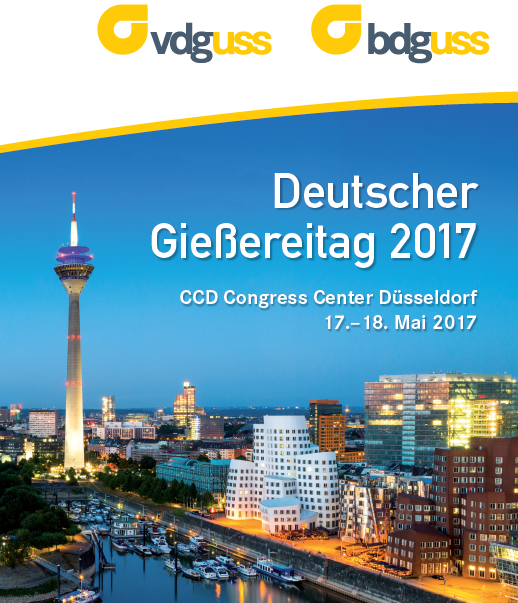 The event is being hosted at the CCD Congress Center in Düsseldorf, Germany. This event offers a versatile lecture program that provides the latest information regarding research results, technical innovations and economic developments within the foundry industry. The topics presented at the lectured series will also address both the present and future challenges the industry faces when positioning itself in the increasingly digital and virtual world. In addition to the lectures, we welcome you to visit our exhibition stand to discuss Simpson’s full range of proven, continuously advancing sand preparation and control technologies. We offer our customers the highest-quality, performance-driven sand preparation technology that minimizes the total cost of operation in terms of supervision, energy consumption, raw materials and maintenance. There will also be an opportunity at the traditional foundry meeting, held on a large Rhine Ship to meet the members of the Simpson global team. We will be represented at this event by our CEO – Mr. Bruce W. Dienst (bdienst@simpsongroup.com), our Vice President of Sales and Service at Simpson Technologies GmbH – Mr. André Klimm (aklimm@simpsongroup.com), and Mr. Heiko Knop (hknop@simpsongroup.com) – Sales and Service Representative at Simpson Technologies GmbH. If you would like to meet with any of these gentlemen during the event please contact them directly. © 2019 Simpson Technologies All Rights Reserved.